Articles about "Asus Eee Pad Transformer Tablet Review" in this website is free. Read our reviews for "Asus Eee Pad Transformer Tablet Review", gadget price, specs, features and find more latest Electronic Gadget Reviews and News. Asus officially launches Asus Eee Pad Transformer Tablet, the prime Asus tablet PC adopting Android OS operating system version 3.0 or known as codename Honeycomb. Jerry Shen, Asus CEO, said the launch of Asus Transformer become a new milestone for this Taiwan-based company, after previously introduced the Eee PC is fairly phenomenal.
" Eee Pad Transformer no ordinary tablet. This will be a new milestone in the realm of Android. We offer the best features with competitive pricing, " he said during a press conference in Taipei - Taiwan, Tuesday, March 28, 2011. New Asus Tablet PC has a uniqueness in the design. It has a special dock to change the function seems like a laptop or notebook. Thus, the features for editing the document will be used in this tablet. Unique design full-size QWERTY keyboard docking station offers two USB ports, SD card reader and an additional battery life up to 16 hours. In addition, the Eee Transformer Pad also features IPS Panel tough and scratch resistant, dual camera, and has been supported by Adobe ® Flash ® 02.10, feature that are not in Apple iPad 2. Asus has been opened through the purchase order ( pre - order) since March 25, 2011 in Taiwan, and consumers are expected to receive the tablets after a two weeks. 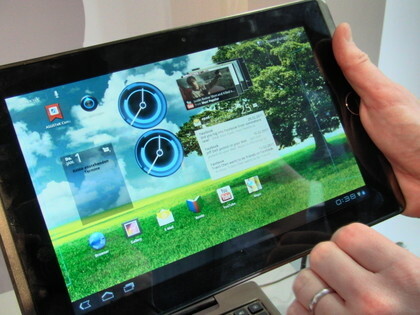 The launch of Asus Eee Transformer is officially in the UK following on 30 March, and then North America. Asus Eee Pad Transformer comes with a touch screen for Apple iPad capactive, which is 10.1 inches. Screen resolution of 1280 x 800 pixels, relatively sharp and feasible to support Android OS 3.0 or Honeycomb. 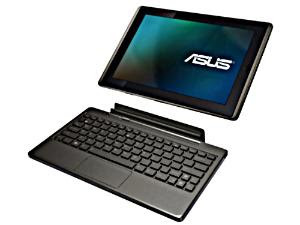 Asus equip Eee Pad Transformer with two memory options, 512MB and 1GB of RAM. In addition, there are 2 processor Nvidia Tegra SoC. This capability is considered adequate to support the performance of tablets that are available with 3 versions, the version 16GB, 32GB, and 64GB. In terms of connectivity, tablet thickness of 1.2 cm with a weight of 680 grams is equipped with Bluetooth, Wi-Fi, USB 2.0, and HDMI for 1080p HD video playback on a TV or projector clearly. Asus Eee Pad prices start from 400 pounds, equivalent to Rp.5,5 million (harga Asus Eee Pad in Indonesia). Tags: asus transformer, asus eee pad transformer tablet, spesifikasi asus transformer tablet, asus eee pad release date, asus transformer price, asus transformer specs, asus transformer review, asus eee pad android 3.0, asus tablet pc, asus eee pad transformer tablet specifications.